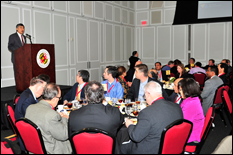 On April 2, 2014, the Center for Risk and Reliability hosted a 25th Anniversary Celebration of the University of Maryland's Reliability Engineering Education Program. From energy, defense and infrastructure to manufacturing, systems and software, reliability engineering is an integral and fundamental part of ensuring that today’s complex technological systems operate safely and efficiently. The University of Maryland (UMD) was the first university in the U.S. to offer a degree granting program in reliability engineering, and it continues to be one of the flag ship programs for the field. Over 120 reliability engineering experts, leaders and alumni attended the event, which kicked off with a symposium featuring presentations from members of NASA, the U.S. Nuclear Regulatory Commission (NRC), Constellation Energy Nuclear Group, Northrop Grumman and the Ford Motor Group. 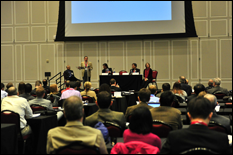 In addition to federal agency and industry representatives, speakers included a host of faculty and researchers from both UMD and universities across the U.S. and abroad. 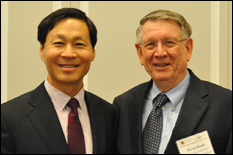 "There have always been reliability engineers, because risk-assessment is so fundamental to so many fields," said UMD President Dr. Wallace Loh. "But the development of reliability engineering as a formal educational program—that is what is so significant. And it is not just that they helped birth a new discipline and educated the next generation, but it is also that so many of you who are here today…helped contribute to the development of this discipline." A series of panelists spoke to the impacts and value of reliability engineering across a variety of disciplines—from nuclear energy to the automotive and defense industries—and explored areas for future research and exploration. Dr. George Apostolakis, Commissioner for NRC and Maria Korsnick, Chief Nuclear Officer for Constellation Energy Group, discussed the critical importance of risk assessment and reliability engineering in nuclear energy for improving safety and mitigating both internal and external risks. NASA Deputy Chief for Safety and Mission Assurance Dr. Thomas Whitmeyer provided insights into NASA's Mars missions and the impact of reliability engineering for successful space missions. Northrop Grumman Engineering Fellow Dr. Elias Anagnostou discussed the impacts risk assessment for deploying new technologies in fixed-wing plane fleets. He highlighted the Defense Advanced Research Projects Agency (DARPA) and Navy's Structural Integrity Prognosis System (SIPS) they used to manage uncertainty and provide actionable information to reduce costs associated with failures. University of Tennessee Postelle Professor and Head of Nuclear Engineering Dr. J. Wesley Pines and Rutgers University Distinguished Professor Dr. Haong Pham presented the audience with perspectives on the challenges currently confronting educators in reliability engineering and highlighted both educational opportunities and hurdles facing today's reliability engineering students. Featured keynote speakers included UMD Reliability Engineering alumni Mr. Kenneth Farquhar, President and General Manager of ManTech International Systems Engineering and Mission Support Business Unit, and Dr. Jeong H. Kim (pictured at left with Dr. Marvin Roush), entrepreneur, chairman of Kiswe Mobile and former president of Bell Labs. Kim was the first recipient of a Ph.D. from Maryland's Reliability Engineering Program, and he discussed the vision and impact of reliability engineering for both the center and himself. "At first, my thought was that [reliability engineering] was an offshoot from the nuclear engineering program—where risk-assessment was a component of it—but obviously with broader implications. But, I quickly realized that the vision for reliability engineering was much, much broader," said Kim. "The vision is that you are dealing with uncertainty. Which happens in industry, it happens in your personal life, it happens all over the world. And how to deal with uncertainty and incorporate that into your decision making process. It was that skill set that I acquired that has served me well over all of these years." The Center for Risk and Reliability (CRR) is the umbrella organization for many of the risk and reliability research and development activities at the University of Maryland Clark School of Engineering. Over 20 faculty from various engineering departments of Clark School of Engineering conduct all or part of their research under CRR umbrella and as directors or co-directors of the center’s numerous research laboratories. CRR is the research arm of the Reliability Engineering educational program, the largest and most comprehensive degree granting graduate program in the field of reliability and risk analysis of engineered systems and processes, offering M.S., Ph.D., and Graduate Certificate in Reliability Engineering and Risk Analysis. Watch videos of presentations from the 25th Anniversary Symposium.